This photo of NdeM dome observation car 108 is from Juan Viladrosa. 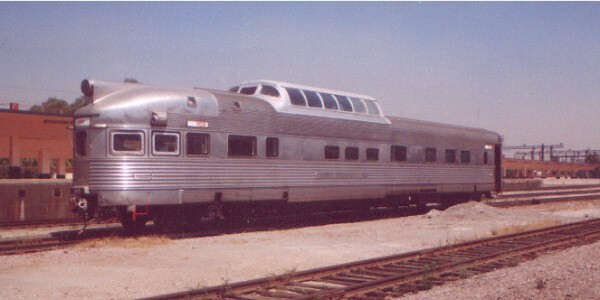 This car was built by Budd in 1948 as Western Pacific 882 Silver Planet, a dome lounge/observation car with three bedrooms and one drawing room. It was purchased with several other cars by the County of Los Angeles for use in a planned commuter service. It was given the number 108 and the name San Fernando. The private rooms were converted to card-playing rooms. The commuter service did not materialize, so the equipment was used by Amtrak as a weekend extra train to San Diego. Later, the equipment was purchased by a private company for use in a thrice-weekly tour train over the Chihuahua al Pacífico between Chihuahua and Los Mochis. It kept the number 108 and was named Chihuahua. When that business failed, the Ch-P received the equipment in partial payment of operating costs and continued to use it. This particular car next passed to the Ferrocarril del Pacífico, and the sleeping rooms were reinstalled at the Empalme shops. The FCP used it as a business car at Guadalajara before it became NdeM 108. This car was next bought, along with ten other passenger cars, two locomotives, and ten cabooses, by people in San Luis Potosí. The private cars are now kept in the premises of Silver Creek International in that city. The dome ob, now undergoing restoration, is called Silver Creek 100 San Luis. NdeM 3518 Presidente López Mateos (ex-NYC Sunrise Brook) is also being restored as Silver Creek 200 Real de Catorce. The car's history was furnished by Ed Von Nordeck. Current information is from Juan Viladrosa. To return to the MEXLIST Photo Gallery index, click here.